Security officials say they're overwhelmed by the recent influx of migrants. Homeland Security Secretary Kirstjen Nielsen will meet with officials in Arizona today after spending Wednesday in El Paso, Texas, continuing her trip to oversee U.S. emergency response efforts along the southern border. Nielsen authorized "emergency surge" operations this week as U.S. Customs and Border Protection officers were diverted from posts processing legal travelers to helping manage the record influx of migrant families applying for asylum. "I want to be clear with the American people: There is an unprecedented emergency at the southern border, and DHS is leading a true government-wide emergency response," Nielsen said Tuesday. The reassignments have led to a slow down of commercial trade across the U.S.-Mexico border. At a border crossing in east Texas, it took cars and trucks twice as long as usual to enter the U.S. Backups were also reported in California and Arizona, a senior DHS official said Tuesday. Experts said slowing or stopping traffic across the border, as President Donald Trump threatened last week, will have devastating consequences for the U.S. economy. The agency is looking to reassign as many as 2,000 CBP officers to assist in the effort, Nielsen said this week. 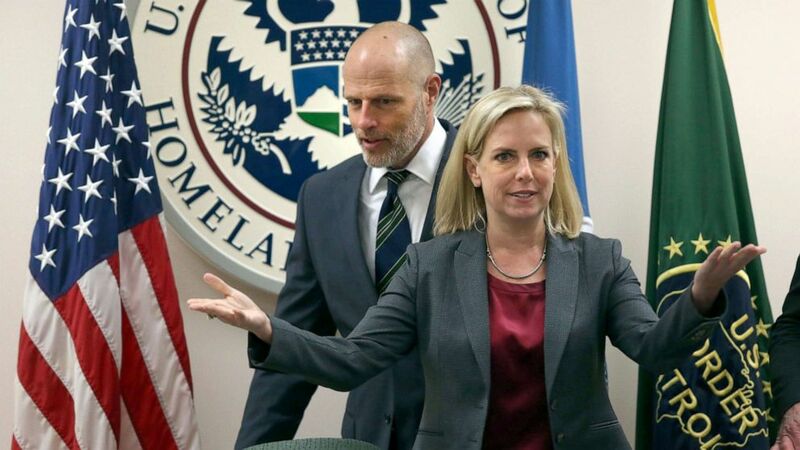 (Delcia Lopez/The Monitor via AP) Kirstjen Nielsen, the secretary of Homeland Security and Ronald Vitiello, visited the Rio Grande Valley on Thursday to meet with local law enforcement at the Rio Grande Border Patrol Sector on March, 21, 2019 in McAllen, Texas. Additionally, Nielsen announced Monday the expansion of the Trump administration’s "remain in Mexico" policy. First implemented earlier this year, the new orders have required certain Central American asylum seekers to return to Mexico and wait for their court date. Asylum cases can take several months or even years to work their way through immigration court. "We are using every tool at our disposal, redeploying personnel and resources, and calling on all federal agencies to assist, where possible," Nielsen said in a statement Tuesday. "While only legislation can fix this crisis in the long term, we cannot wait for Congress to act." Former DHS acting undersecretary John Cohen said while the agency is now taking steps in the right direction, Nielsen should not pass the burden of responsibility to Congress. "It undermines public confidence in the organization's operational abilities," said Cohen, who is an ABC News contributor. "When you are a homeland security operational organization, you do not have the luxury to say we can’t handle a crisis." Editor's Note: An earlier version of this story said Nielsen would meet with officials in Arizona on Wednesday. She was in El Paso, Texas, on Wednesday, and is scheduled to be in Arizona today. The story reflects this change.